BULLETIN: By coincidence, this morning’s News-Leader features Matt Forir, the paleontologist in charge of researching Riverbluff Cave, which is the subject of CAVE DETECTIVES. Matt and a team of volunteers recently returned from Wyoming where they dug up the fossil remains of a large bull triceratops. The ancient creature, estimated by Matt to be about 67 million years old, will be reassembled here and mounted for display at the Natural History Museum. 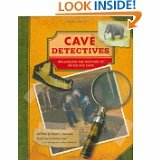 I worked on the board that helped create the museum and was on it while working on CAVE DETECTIVES. Way to go Matt. I haven’t been checking on the status of CAVE DETECTIVES, UNRAVELING THE MYSTERY OF AN ICE AGE CAVE, since it went digital in February. 8th in science, 32nd in archaeology, and 34th in prehistoric. Here’s the link if you’re interested. My thanks to Marla Wuench for inviting me to visit Truman Elementary School yesterday. I had a fine time with 150 1st and 2nd grade students. I told them I’m 200 years old. Some looked stunned but didn’t challenge it. I received a wonderful book of poems from the kids in Mrs. Darnell’s First Grade Room and an enormous poster signed by dozens of kids. My thanks to all.